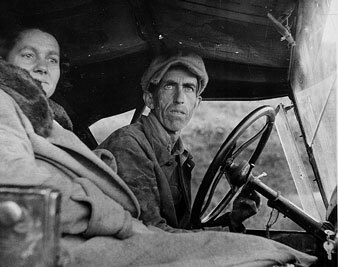 A journey through the American heartland reveals the anger and desperation of the Great Depression. I found John Wirds in his courtroom–he is a judge of the Superior Court–trying to save the farm of a seventy-five-year-old member of his family. When he had freed himself from that task he gave me of his time unrestrictedly until after eleven o’clock that evening. No Mussolini here, but a man with great strength in his powerful though unhandsome visage. He volunteered for the war and then came back determined to get a college education. He put himself through college and graduated from the law school at the age of twenty-eight, having supported a wife and two children with the wife’s aid, and winning only “A’s” in his law studies. It takes character to do that, and readiness to live on extremely humble fare. Now he has organized 90 percent of the farmers of his county in his union, and the movement is spreading into adjoining counties. From one of the latter there came to him one morning five telephonic appeals for help. There was trouble at the county seat; there were ropes in the crowd, and there was certain to be violence if he did not come to their aid. He adjourned his court, jumped into his automobile, and drove at full speed for the place–in time to prevent bloodshed, in time to see the discomfited mortgage holder withdraw in haste. About 250 members of the crowd followed him into one of the rooms of the courthouse and asked what he thought of the proceeding. He told them that he did not like what they had done; they had not done enough for the mortgagee, and they had not insisted that the owner of the farm should pledge himself to do what he could to pay something, however little, to the mortgagee. The crowd was stunned. “We are running this thing along Golden Rule lines,” said John Wirds, “and we are going to be just as square about it as we can possibly be.” The crowd at once began to take up a collection for the mortgage-holder; $250 was the objective. The next day on to Minnesota, the farmhouses growing more unkempt, the countryside less prosperous looking, and then St. Paul and Minneapolis. Minneapolis is proud that it raised about a million and a half dollars for its community chest, that it has been able so far to take care of its own. But when I put my question to three of the leading business men of Minneapolis, they could not conceal their dismay. “Minneapolis will get by somehow, but our businesses, the country–what will become of them in two years?” One of these gentlemen has a 30,000-acre farm. He sold it a few years ago; it has come back to him; much against his will he is establishing a tenantry upon it. I asked him whether he foreclosed or dispossessed. “Never,” said he, “when a man shows good faith and does his best.” But he confessed that he did not see what was ahead for any of them. From others I learned that of the 800 Minnesota banks 200 are able to operate only through an agreement with the depositors that for the next five years they will withdraw only 10 percent of their deposits each year. Well-informed men tell me that if there is no improvement, 500 of the 800 banks will be on the same basis by next fall. Everywhere I heard the Reconstruction Finance Corporation praised for standing by Charlie Dawes’s bank: “If they hadn’t done it, hundreds of banks would have failed in the West and Northwest.” I found one town that faced the future absolutely unafraid–Eau Claire, Wisconsin. According to its leading editor it has not felt the crisis for longer than a year and it will have no difficulty in fighting its way through for two or three years more. One of its factories is running full time. Everywhere else I went there were the same stories of blasted homes, ruined banks, wrecked existences; men and women have seen the labors and savings of a lifetime go to nothing as if overnight. A terrible feeling of fear and insecurity has come over the great rural stretches. People no longer feel safe; the dread of each day is upon them even though their cellars are full of unsold corn and vegetables. Their children are marking time; they themselves have nothing to look forward to; there is nothing left of any security for old age. They are puzzled, deeply disturbed, profoundly outraged–stunned that such a disaster could come to “God’s country.” They have no desire to turn against the flag. The farmer organizations are not against the government as such. They are standing unitedly against the Wall Street front; they believe, as did Woodrow Wilson in 1912, that the financial system under which we have been living, operated as it has been by those Mr. Wilson called “the masters of privilege, the owners of big business,” has been “slowly girdling the tree that hears the inestimable fruits of our life,” and that, as he prophesied, “nature has taken her revenge,” because they have entirely girdled the tree and the tree is dying. They are no longer afraid of the name socialism, and they tell you frankly that there would have been hundreds of thousands of votes in that section for Norman Thomas had they not felt that the all-important thing was to sweep Herbert Hoover out of office. In all three States–Iowa, Wisconsin, and Minnesota –newspapermen told me that they had never guessed how deep the feeling was against the President, or how high the tidal wave against him would go. People tell you frankly that the Democratic Party not only has but a short time in which to make good, but that it must demonstrate once and for all that it stands for the people against the “interests,” and that they will turn to theSocialists, or Huey Long, or anybody else who will take the lead toward a new political and social order. But whither, whither? That is the question. They see life on the farms dying, their crops going for so little it does not pay to market them; they see milk selling for three cents a quart, which doesn’t pay the feed bill; they see the children dropping out of school for lack of adequate clothing, and the schools in danger of closing because the teachers can no longer be paid. They see the small towns drooping, bank after bank closing, although they were told that the Reconstruction Finance Corporation had, or would, put an end to further bank failures. They see paralysis descending upon the small towns–more and more “to let” signs appearing in the empty shop windows. Their patience is magnificent; their resignation, if anything, too great. If the farmers are acting through their organizations, which may be best described as benevolent protective associations, the people of the small towns are voiceless, unorganized, unable to act in common. But not for long, certainly not for two years. It does not seem to me after those days in Iowa, Wisconsin, and Minnesota that they will see their neighborhood die by inches without some protest. They know that things are getting worse. Not a single conductor on bus or train would tell me that things are getting better; the trains are pitiful in their emptiness; the highways are beginning to be deserted. “What has become,” asked a railroad conductor pathetically, “of American enterprise, energy, and invention?” What, indeed? And what has become of our leadership in the face of the destitution in our cities, our stricken countryside, the misery of our people?